With a world of information and accessibility in their pockets, customers can engage with a brand whenever and wherever they want. This flexibility has made mobile technology an essential part of the way both customers and businesses interact. And to deliver experiences that feel personal and intimate, your plan needs to account for a critical building block to any relationship: trust. 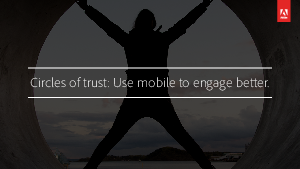 Read Circles of Trust: Use Mobile to Engage Better, to understand how you can leverage trust to deliver a better customer experience.